[UPDATED] How about meeting a Penan musician on Malaysia Day? This is your chance for a face-to-face encounter with a Penan musician. Come find out first hand what you’ve always wanted to know while enjoying an evening of music. Happening on Malaysia Day at Central Market Annexe and in Penang on the eve. You may have heard in the media something about the Penans being bullied while defending their rainforest, and then wonder why they are adamant in sticking to their nomadic lifestyle while almost everyone else is rushing mindlessly deeper and deeper into the modern world. Here is your golden opportunity: Meet a talented Penan musician in Penang or KL for a Malaysia Day celebration! Get to know first hand what it is about leading a minimum footprint lifestyle in Sarawak’s world renowned rainforest. Nothing beats a face-to-face encounter if you are not satisfied to keep the Penans as an enigma! Remember, Penans are also our fellow Malaysians, who could one day, be our friends next door! Kilah Kuit is a leading Penan sape player from Murum, now living in Sg Asap, Belaga. He has been noted for his musical talent in Belaga from young. He has been invited to play his electric sape for various functions such as new year, welcoming parties, festivals, and even funerals. His expertise in playing the unique musical instrument from the Orang Ulu of Sarawak has made him a much sought after partner for many other well known local sape players in Sg Asap, Belaga. 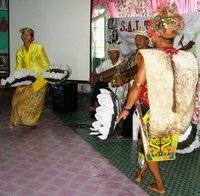 Sape is best played as a duet performance, according to local experts. For this trip he will partner with Miku Loyang, the president of the Kayan Cultural Association, to present his captivating jazzy compositions! Another partner in the Sape group performance is Juna Saran, Miku Loyang’s spouse, who has consented to perform her special Ngajat dance for the Penisular audiences. Come to meet this best kept secret from the Borneo rainforest. Find out what is in the music that keeps up the spirit of this special community. Many of them are still leading an endangered forest dwelling lifestyle! Official figures put their number at 16 000, about the smallest ethnic group in Sarawak. RSVP your attendance on Facebook! See you there. Posted on 9 September 2010. You can follow any responses to this entry through the RSS 2.0.